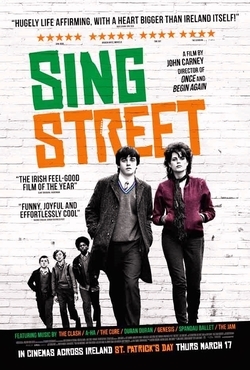 John Carney’s latest film, ‘Sing Street’, follows a similar template to ‘Once’ and ‘Begin Again’, but on this occasion the setting is a 1980s catholic school in Dublin and we can tell that this is perhaps a more biographical outing than his previous efforts. ‘Sing Street’ is a funny, charming and feel good musical drama about a 15 year old boy who forms a band to get a girl – the attractive model Raphina, played by Lucy Boynton. This initial premise leads to some great, funny moments as Conor (also known as Cosmo, played by newcomer Ferdia Walsh-Peelo) tries to assemble his band and they begin to find their influences, with a little help from his older brother (standout Jack Reynor), but the film also reveals some hidden depths and there are little swipes at the catholic education system as well as the difficulties as a child going through your parent’s divorce. ‘Sing Street’s bread and butter is its music though, and by god does it sparkle in this element. The collected soundtrack covers various 80s musical touchpoints from Duran Duran to Spandau Ballet, taking in various others such as The Cure along the way (I could have done with some ‘The Smiths’ buy hey ho! ), with the film niftily displaying its influence on the young band by their ever changing dress sense. The original songs composed for ‘Once’ and ‘Begin Again’ were terrific and John Carney (with writing partner Gary Clark) has nailed it once again, with songs that are both catchy and well written. They also sound distinctly from the time period, which is testament to Gary Clark in particular who’s built a career out of songwriting with an 80s edge. Of course a school band are unlikely to be capable of writing songs as mature as these efforts, but in some respects that’s not really the point. Carney’s films are often more about evoking feelings and emotions through the blend of music and cinema and he’s undoubtedly successful here. Carney’s assembled a cast of relative unknowns, anchored around more established names such as Maria Doyle Kennedy, Aidan Gillen and Jack Reynor as Conor’s mother, father and brother Brendan respectively. Reynor is the film’s best asset in a performance that starts off funny and becomes eminently more compelling when he starts to reveal his regrets at Conor living the life he wanted. I think in some respects Brendan acts as a surrogate for Carney’s true feelings on music, the time period and regrets, and in Reynor he has a young actor capable of covering all bases. There’s a terrific scene at the start where Conor and his family talk about nostalgia and how it’s important to be your own man and do your own thing, and whilst there’s a certain irony in criticising nostalgia in a film that is undoubtedly nostalgic for its era, it works as the overlying theme throughout. Chase your dreams, have no regrets and you might get them. The film blends the music Conor writes with the goings on in his personal life, from the troubles with his parents and headteacher to his lust for Raphina and it’s very effective, even if the film does go for a conclusion that feels a little too saccharine and neat. It takes little away from a smartly written film with great music and fun performances and ‘Sing Street’ comes highly recommended.